Unless otherwise specified classes and courses take place at Dancing Moonlight, a 30 min. drive North-West of Galway city. Dancing Moonlight is located in a hundreds of years old stone built village, Oakfield (translated from the Irish Gort Na Darragh). Oakfield is part of a gentle mosiac landscape of native Hazel woodlands and cow pastures, near the shores of Lough Corrib in the Southern wooded fringes of Connemara. 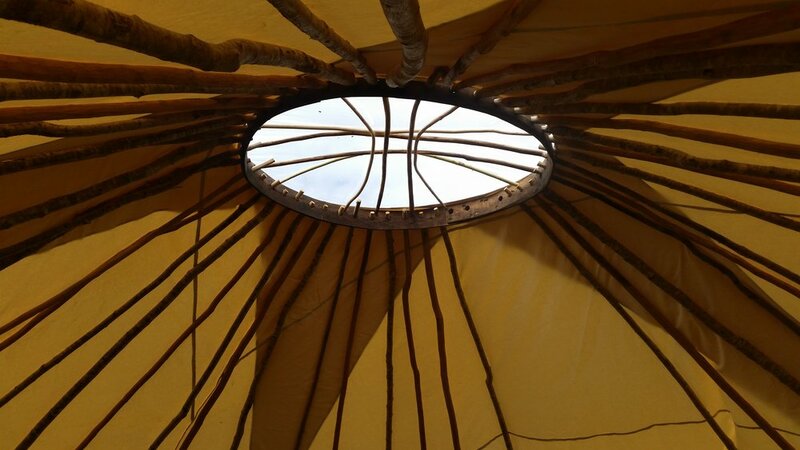 The facilities at Dancing Moonlight include the DreamLodge, a hand-crafted 20 ft yurt built from the surrounding woodlands (built by Sky), a green house teaching and living space, glamping accomodation, all held in the loving embrace of the surrounding woodlands, wildlands and fields. Dancing Moonlight is also available for rental as a workshop venue. The Dreamlodge is a multi generational building project of mother and daughter, Sky and her mother Julia, along with the help of many others. It is a round straw-bale building with a grass roof, with all natural plaster and paint finishes. Inspired by the sanctuaries at Findhorn in Northern Scotland, it was originally built in 1997 during an all women's natural building workshop. After the workshop the roof and other components were completed by Julia, her husband Piet and a local carpenter, Micheal. Some years later Sky, with the help of many willing volunteers, did some repair work and took care of the finishing touches, putting in wooden floors, the interior earth plaster and a wood burning stove inside. It really has been a labour of family love! The DreamLodge is for dreaming... personal and collective. It is for all activities that enter the dreamtime, that place that exists beyond time and the physical, be it meditation, story-telling, dancing, ceremony or other practices of deep listening.